At age three Emily already had her eye on one of her grandmother's chic finds: a round gilt-metal table with a stylized "wheat" base and a glass top. Emily said, "Mimi, when I grow up I'm going to have a table just like this." Helene B., or "Mimi" as the twins call her, is an elegant former teacher from Montreal who now can be found assisting customers at Interiors Market. She began introducing the girls to fine art when they were babies, using pieces around her Atlanta home to stimulate the twins' minds by asking them to find the biggest shape or the longest line, or to identify colors. Figures and anatomical sculptures are a passion of French-speaking Helene's. She and her husband recently took the girls to the High, not to the children's area, but to the Louvre Atlanta exhibition to sketch and view the busts of Voltaire and other luminaries. When Helene became a grandmother, many of her friends thought she would have to put away her vast collection of fine objects. Instead she chose to keep everything out and teach the twins to be at home around these things. Her dressing room is a fantasy hang-out for all little girls. But more important than an appreciation for art and beauty is the sense of belonging and wonder Helene offers the girls. Beneath the grand rock crystal chandeliers are pint-sized furnishings that let the twins know they are welcome. Many thanks to Helene for generously giving us a sneak peek at her exquisite collections. The other day I heard from a Gloria Vanderbilt fan who longed to see more images of her very autobiographical Manhattan home as it appeared in Elle Decor, October 2000. So additional pictures have been added to the "Year 2000" post below. (Be on the lookout for something red and something shabby in at least one room.) Above is a portrait of Vanderbilt painted by Carol Matthau. Like Jennifer Boles and Charlotte Moss, Toronto designer Jane Hess has an amazing archive of vintage magazines. 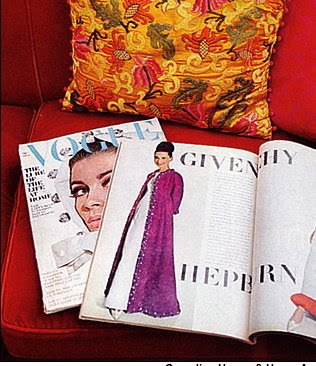 In fact, her 40-year collection of Vogues was chronicled in the April 2008 issue of Canadian House & Home. In response to my question in an earlier post, "What tastemaker said every room should have a touch of red?" Hess found one possible answer: Lady Juliet Duff. 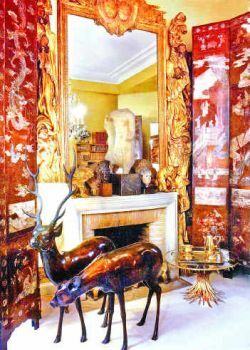 According to Hess, the English aristocrat believed an interior should have one red piece and a touch of the shabby. The painted bulletin board above, in an early Miles Redd bedroom (Elle Decor, March 2001) definitely adds a punch of red. Shabby is open to interpretation. I don't see anything really threadbare or peeling here, but I'm guessing some of the accessories on the chest are vintage and time-worn. Click here to learn more about Redd's inspiration. I think a chic bulletin board is a brilliant alternative to expensive art. Unframed sketches found at flea markets or student art shows could be rotated on it. Over the next few days I plan to highlight other rooms with "something red and something shabby." Stay tuned. In the '90s an artistic friend of mine, who described herself as "living on the wrong side of the tracks," got me hooked on Elle Decor. Back then she could afford few things seen on the pages but she swore by the magazine as a great source for original ideas. Elle Decor, October 2000, is an issue that stands out in my own mind. It was filled with stylish, soulful homes that really reflected the spirits of the owners. Christina Greeven (now Cuomo) was on the cover and her New York apartment was featured. I still love the caned sofa with the bright pillows. Click here for more glimpses of that residence. Above and below, the Seville home of Nati Abascal. Below, Gloria Vanderbilt's home was described as autobiographical; filled with references to the famous relatives from which she once tried to distance herself. Note too the mix of opulent pieces with more humble American craft. There is a portrait of Vanderbilt with sons Carter and Anderson Cooper. Princess Siki of Somalia, below, in the South of France. Even Alexa Hampton's illustration of the late Bill Blass' home was in this issue. The magazine described it as "drop-dead" and one of the most stylish of our time. Finally, for my fellow Charlie Rose fans, did you know he has been on the cover of Elle Decor? I'll see if I have the issue packed away. For more vintage tear sheets, click here.